Wisdom teeth are the last of your adult molars to enter your mouth. Wisdom teeth usually appear between the ages 16 and 25. 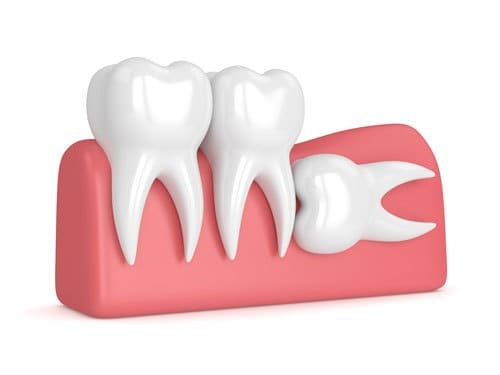 Most adults have four wisdom teeth, but it is possible to have one, two, three or none. Our diet over the last hundred years, has become softer and softer. The modern diet requires less chewing, and consequently some of our jaws have become smaller. This means teeth will become jammed or crooked. If this happens infection gets in through the space between the gum and the tooth and caused infection in the jaw bone. Often the only way to restore your health is to have wisdom teeth removed. We have ample experience in removing wisdom teeth. You will be treated with the upmost care and we can use “happy gas” to help you relax through your appointment. We will be able to assess which option is best for your individual needs.